The lives of American gangsters have been brought to life countless times, from the “Godfather” to HBO’s “Boardwalk Empire.” Rum running, gambling, beating and killing — these men lived hard, violent lives that continue to fascinate us. But while they all had cruelty in common, their home lives differed quite a bit. Some reveled in excess, others like Al Capone actually lived in sleepy suburban bungalows. Take a peek at the houses of some of America’s most famous gangsters. 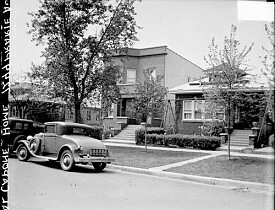 Al Capone: Capone bought the sleepy suburban two-flat on 7244 S. Prairie Ave. for $5,500 in 1923, when he moved to Chicago from his native Brooklyn to help set up bootlegging operations in the Midwest. The historic home went up for sale a few years ago and its $450,000 asking price was double that of neighboring houses despite its ordinary landscaping and facade — a premium due to its connection to the one and only Scarface. While the home was certainly modest by mobster standards, it does not seem to be the result of some monk-like denial of pleasure on Capone’s part. Ever the shrewd tactician, Capone probably chose the home because it was unlikely to draw suspicion. And its location deep in Chicago’s South Side kept it well out of the way of Capone’s booze-running activities in Cicero and downtown Chicago. If you’re going to be one of history’s most successful and notorious gangsters, here's a good rule to live by: Don’t mix business and family. Johnny Torrio: Often remembered as the man who mentored Al Capone, Johnny Torrio was himself one of the most infamous bootleggers of the prohibition era. Torrio’s home — located at 7011 S. Clyde Ave. in Chicago — was a nice, but modest South Side apartment, and site to what almost became his last day on Earth. In 1925, a handful of Torrio’s adversaries attempted to assassinate him on the concrete steps of the Chicago apartment. Wounded, but not fatally, Torrio would leave Chicago forever once he recovered, turning all of his Midwestern operations over to Capone. Bugsy Siegel: Often credited as the man who transformed Las Vegas from a sun-parched desert outpost into a hotbed of gambling and sin, Bugsy Siegel actually preferred the cooler climes of Los Angeles and only reluctantly took up the Nevada project at the behest of the mob. Siegel lived in a few homes in the L.A. area, including one later owned by Madonna, as well as a mistress’s home in Beverly Hills, where, in true gangster fashion, he’d meet his demise. His main home was a lavish piece of property in the Holmby Hills neighborhood, near Bel Air. When the property — located at 250 Delfern Drive — went on the market a few years ago, it was listed at $49.5 million, but has since been reduced to a far more affordable $22.9 million. Even at that price there’s been a little trouble finding a buyer. So if you’re in the market for a five-bedroom, seven-and-a-half bathroom home sitting on nearly two acres of some of L.A.’s choicest real estate, you’re in luck! Blown Away By A Lovely, Affordable Handyman -- In New York City!